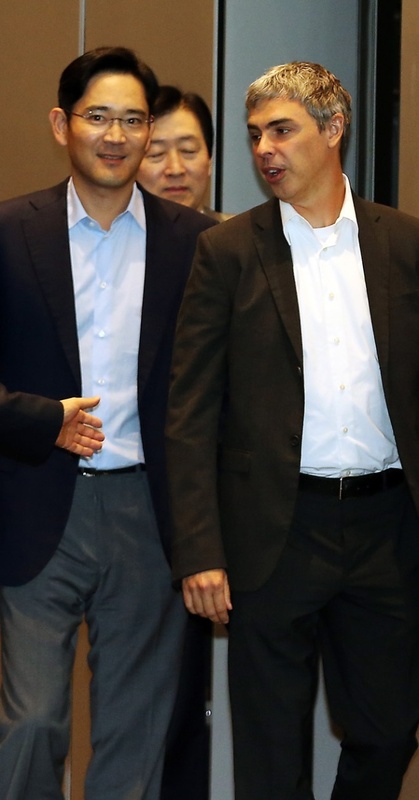 Samsung Electronics vice chairman Lee Jay-yong (left) is with Google cofounder Larry Page in a 2013 file photo. Samsung Electronics vice chairman Lee Jay-yong is frantically seeking support from its global partners before unveiling his firm’s Galaxy S5 smartphone at the Mobile World Congress in Barcelona this month. The vice chairman and Larry Page, CEO of Google, met late last month to discuss their relationship, but both firms expressed discomfort with each other’s position, according to The Information, a tech news publication. This was mainly due to Google’s move to restrict its partner from tailoring its Android operating system for smartphones. Market watchers speculated that the Korean company had sought Google’s approval for the tweaks Samsung made to Android for its upcoming Galaxy S5. The design of the OS installed on Samsung’s next flagship smartphone is likely to be drastically altered, as the OS failed to meet expectations on the Galaxy S4. The California-based company has reportedly discouraged its partners, including Samsung, from developing mobile applications that could compete with Google’s apps. News reports on Lee’s trip to China on Thursday also indicated Samsung’s efforts to beef up its ties with its key export market before the launch of the Galaxy S5. Chinese news outlet Xinhua reported that vice chairman Lee met with Wang Yang, China’s vice premier, and both pledged to strengthen their relationship. News reports said Wang asked Samsung, the largest smartphone seller in China, to help strengthen ties between Korea and China, although they didn’t specify how. President and CEO of IBM Ginni Rometty also met with the vice premier. Lee and Rometty were in China to participate in the China Council for the Promotion of International Trade, and the Chinese People’s Association for Friendship with Foreign Countries, respectively.